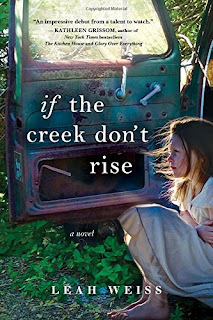 So, I feel like a jerk, but I just did not care for If the Creek Don’t Rise by Leah Weiss. I recognize that it may just be where my mind is at currently, but this book, while well-written, was incredibly depressing and slow moving. Those who have been following me know that I do like my share of depressing novels, but I need a little bit of happy so my tears are worth it. I had to force myself to keep reading because it did not capture my attention. Then, the plot and characters were so sad that I did not find many reasons to want to keep reading it. For example, the characters live very hard, poor lives in rural Appalachia. However, they do not seem to learn from their choices and just continue living the same sad lives – getting beaten, alienating others, hurting relationships, etc. I really wanted to like this book more since I have heard so many rave reviews and it is set in time/place and a genre I usually enjoy reading about (Southern fiction). In this case, it just did not happen for me. However, I will say that for a character-driven novel, the author does a nice job of creating a vast array of characters. I did not like or relate to many of them, which made it difficult in a character-driven novel. But, if you like novels more focused on character than plot. And novels that are gritty, realistic, frank, and depressing, then you will most likely enjoy it. I do believe I am the weird one here as the book is getting quite a bit of praise, but I just couldn’t wait to finish it so I could read something more enjoyable. Sorry! * You may purchase this book from Amazon here. This is an affiliate link. Thank you for supporting my blog!